You need to have an Account Owner privilege to invite users to your Kanbanize account. Step 1: Open the Administration panel via the icon at the upper right side of your account. Step 2: Click the Invite User button to open the invitation panel. Invite individually users by entering their email address in the dedicated field (1). (1) a Workspace Manager for the selected board(s). If you tick the respective box, the user will get full permissions for those boards. (2) If you don't assign the user as a Workspace manager, set a checkmark on the board and define a Role from the dropdown list. You can select between the default system role and any of the custom roles that you have defined. Step 5: When you complete the invitation process, the user will be added to the Users management panel having a status not confirmed until they accept the email invitation. You will not be able to edit not-confirmed members' settings. -> Click the grey envelop to resend the invite if necessary. Please note that resending the invite will make the original one invalid. Step 6: When the user that you invited confirms the invitation you will see their names in the Users panel. Step 1: Open the Administration panel and click the Invite users button. Step 2: Select Import Users from File. You can import users from xlsx, xls, csv, and txt files. For xlsx and xls files, put all emails in the first column, one email per row. For CSV files, put all emails with a comma delimiter. For txt files, put each email on a new line without any delimiter. -> Browse the file to upload it to Kanbanize and send bulk invites to the users. Step 3: You will get a system confirmation message that the users have been imported successfully. Users will receive Kanbanize Invitations in their mailboxes. Step 4: Go ahead and assign the new users to the Boards from the Administration panel. Use the Board Members tab or the Assigned Boards option of the Registration Members Settings that belongs to every user. Step 1: You can invite users directly from your board -> use the Invite Users button on the sidebar located to the right side of your Board interface. 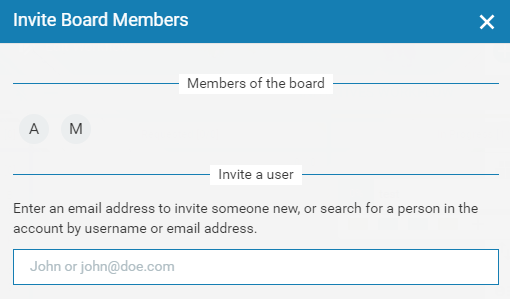 Step 2: Enter an email address to invite someone new or search for a person in the account by username or email address to add them to the current board. When you enter/select the email, the panel prompts you to define the user role for that board. In this case, you have to either disable a user and use their free license or contact Kanbanize sales team to upgrade your account.